For most video game developers, digital distribution is the most convenient and affordable way to make a game accessible to the masses. The downside here is that the majority of online game stores are now inundated with multiple new releases on a daily basis. It can make finding the game you actually want a real hassle. On the plus side, there's now less shovelware and budget titles available in physical form than ever before. It might not stay this way, though. Of course, this isn't the first time we've seen this sort of thing. A number of companies including Nintendo have begun to sell game boxes with codes in them in recent years. What's surprising in this case is how budget game publishers have worked out a way to sell these cheaper titles in store again. Would you consider adding any of these to your Switch library? Do you already own one of these games in digital form? Tell us below. Such quality games. They definitely deserve a physical release. I'm curious about this James Pond: Robocod game. I loved the series? Is it a new game or just a port of James Pond 2? It makes me wonder what the people who buy these games actually do with the cases after they've downloaded the game. Do they keep the cases or throw them away. Who the hell knows, the whole things dumb! .....Um, what's the point of this again? Uggggh, James Pond. One property that should have stayed stuck in the past! Impossible Mission is a mildly amusing choice, though. Wonder if it will include the remixed version from the Wii and PSP. I wish Nintendo still had the seal of quality. This feels like the new player's choice, selects etc, to me. Ugggh....Why....It's never worth it if there's no cart. 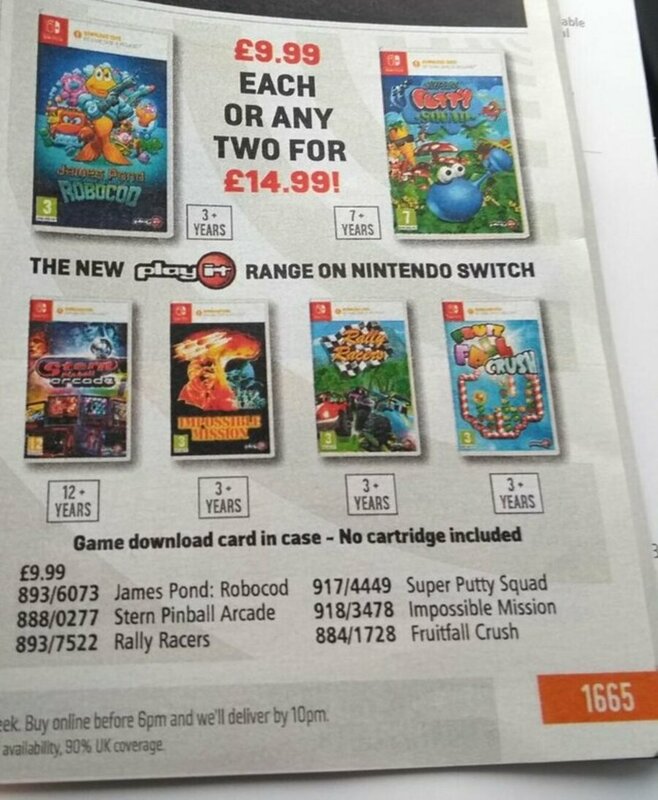 Wait, hold the phone - Since WHEN was James Pond on Switch? That coming soon or something? @GyroZeppeli To Stern Pinball Arcade's credit, it is a great time for virtual pinballing. Its tables are superb recreations of real cabinets (and it already does have a real physical release, rendering this tactic all the more confusing). Am I the only one who thinks it's silly to buy a case for a digital game? For what, so you can place it on your shelf in the background of your YouTube video. @RyanSilberman Yes, but it’s like a diamond in a pile of dung. You are quick to say the feces look bad, so it’s hard to know there’s something good inside. Kind of like the stuff by Forever Entertainment and Qbic Games. @Painkiller_Mike You are definitely not the only one. Physical cases should have physical carts. Digital codes in physical boxes only exist to prey on those that don’t know any better. I have no interest in buying physical boxes with download codes but this seems like a smart business decision. Their best chance of selling these games are for parents to buy them for their young children. I can't imagine them getting many sales buried in the eShop but the physical shelf exposure might catch a few who don't know any better. I personally have no interest in buying a box with a code in it. Here in Japan many major first party releases have code cards you can buy, even in convenience stores. They are basically just like NSO online codes or Amazon gift cards(the latter of which I buy often because I dislike using my credit card). Why not just do this? I seriously doubt there are many people who prefer physical just cause they want the box! @GyroZeppeli Eh, I don't think I'd put it that far. You are at least able to get the games separately and view them on their own merits. It's not like you have to buy them all. James Pond : Robocod has never actually been officially announced for Switch from what I can tell. It was supposed to be coming to Wii U and 3DS years ago but I don't think it ever did? the amount of plastic wasted on this is appalling, i thought there was supposed to more done to reduce the waste of plastics. Meh anything that is Soulja Boy quality shouldn't deserve a place on the shelf. What a waste of plastic and paper this is. Physical game cards are slowly becoming obsolete. Seeing this, it looks like sooner rather then later. Wonder what the "hold outs" for physical game card do once digital games become the common standard? @Shade_Koopa Take up board gaming. In-store visibility. Some casuals and kids seem to not care what's on the eShop and see only what's in store. Some didn't even know Fortnite is free to play that can be downloaded on the eShop but goes to buy the physical code version. Erm, waste of plastic? Other stores just give you a receipt with a code. @retro_player_22 DuckTales Remastered on PS3 first did the code in a box thing before getting an actual physical version. But that's DuckTales. It really only makes sense to do a code in a box for something of that level of hype. Not a bunch of games, based on properties which some of them may have a small nostalgic fanbase at best. Impossible Mission? Is it a remake or the C64 game? @Pally356 It's most likely the same port of the CD32 game (which had totally different levels than the Amiga, C64, console versions) thats been shat on PS1, PS2, GBA and DS. I was wondering when it would be coming to Switch seeing its getting been every low budget release. Would love to have the original game on it, no idea why that CD32 version had new levels when the thing at the time was to just port any Amiga game with the least amount of effort and add a animated cut scene. @Trajan Yeah cause that certainly insured only quality games got released. Impossible mission, what version ??? This is quite hilarious. Stupid stupid stupid. Why not just release five games on one cartridge instead of trying to make money off a single physical game? We need some Indie compilations. the question is: when will nintendolife review these gems? pointless having an empty box imo but the price point I like. stern pinball i have played the free table and really liked it. I always wanted to get the other tables but thought it was a bit expensive. at that price and maybe get another title as well makes it £7.50! bargain! I have James Pond and Putty Squad on the 3ds. Both good games. But Super Putty Squad did get a complete physical release in the UK already and you can still get copies from Amazon. Wow, does PlayIt still exist?? I remember them from the PS2 era where they were the shovelware publishers for the platform (with Midas). Hahaha, how I didn't miss them. Sorry to break with convention, but I love Robocod. It was the only legit game we ever got for our Amiga, one Christmas, and we loved it. The music (Amiga version) is quintessential video game music to me. I will compare the boxed code price to the eshop price and make my decision accordingly. Play It is a brand of System 3, games industry publishing veterans. Impossible Mission is indeed the old - but good! - Commodore 64 title and we have seen the game before on both the Wii Virtual Console and, in a slightly refreshed version, on the DS. I've never heard of this James Pond: Robocod game before. This is so stupid, and I imagine that most of these games are only a few hundred megabytes in size, so, even for 10 quid, there should be a cartridge in the case for shovelware like this. James Pond 3 is the one that i really want on Switch, but it has never been re-released to my knowledge, not sure why ? Physical is usually going to be best, that's how i like my anime.. physical = mine, and better than streaming quality. Also best for resale purposes. The only digital only games i have are on PC via Steam. ...this isn't what we all meant be wanting more physicsl releases. This makes no sense, just have DL code on cardboard you can scan for a code on the transaction copy.. They have just as much visibility in stores. Way to trash the planet, not that there is any hope left anyway. While this doesn't make a lot of sense for us, it makes perfect sense for smaller indie developers who have small budgets to work with and probably can't afford to shell out for game cards and whatnot. With how many releases are pushed out on the eShop every week, it can take less than seven days for a new release to be shoved off the "Recent Releases" page and never be heard from again. Having a physical store shelf presence with plastic cases probably costs them much less than game cards and still gives them the additonal benefit of sitting alongside of other, bigger retail releases. Impossible Mission?! Is that the game I think it is? The old computer game? Or is this just a game with the same title? Because I enjoyed the original Impossible Mission back in the day. I'm going to start my own company called Limited Run Cases where I make game cases for eshop games. I'll make regular cases and super expensive special edition cases that are just regular cases in a box with maybe a key chain and a poster that's like one fifth the size of what any reasonable person would think a "poster" should be. I don't want to think about how much I paid for a physical version of Stern Pinball when it first came out in the United States. I think I could get this entire collection of "games" for how much I paid ($40 USD). James Pond and Impossible Mission are the only new games on this list. The rest is already out on Switch. Impossible Mission has the same cover as the classic 1985 game. It (and every other game on this list, I believe) is made or published by System 3, the same team that made the Impossible Mission remake on Wii and DS. I assume it's the same remake - just in HD. I would double dip if it had the two original C64 games on it - I always liked the sequel better. If it's just an old Wii/DS port it would be quite underwhelming for those wo already played them, but for those that missed this remake 10 years ago it's probably good enough. @Trajan: The Nintendo seal of quality was not really for quality control per say. The seal was a means for Nintendo to make money. Co.s that officially wanted their games, and/or accesories on a Nintendo system had to pay a license fee, and probably sign a contract for the seal to appear on their product. This also allowed Nintendo to somewhat control the image of their retail presence, since a lack of the seal on a product might turn off a potential buyer. @Capt_N they used it to control shovelware. Or that was at least the idea. Learning from the crash of 83. @Trajan the seal of quality only guaranteed the quality of the physical production of official cartridges. It has nothing to do with the amount of enjoyment that could be had from the games. That’s what magazine reviews were for. These budget games are actually good compared to some of the old NES games that got the seal of approval if you insist it refers to quality of entertainment value. @Shade_Koopa "Physical game cards are slowly becoming obsolete. Seeing this, it looks like sooner rather than later." Moving on from the daft empty boxes thing.... I love Robocod and Impossible Mission! Anyone know any details on what these versions involve? It seems useless to have a physical version of a game that doesn't actually have the whole game on a card. James pond and putty squad is what i choose if i blew 15 pounds on these. This is great for the climate (sarcasm, sarcasm)! Did these games ever get a release date?